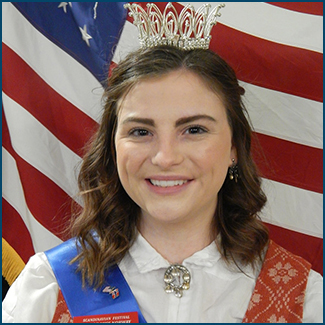 The Scandinavian Midsummer Festival Court consists of Miss Scandinavia, junior and senior princesses sponsored by the Danish Society, Finnish Brotherhood, Sons of Norway and VASA Swedish Lodge, chaperones, and a crown bearer. 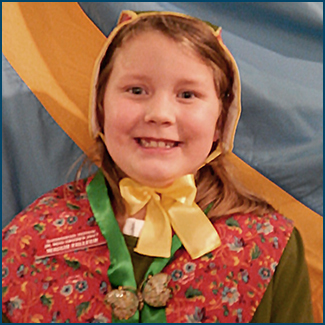 Megan attended the Astoria Scandinavian Midsummer Festival with her family as a child. She actually learned to make lutefisk with her grandfather but says she never could bring herself to eat it. 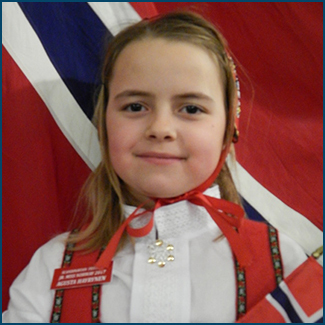 She has cousins in Norway and hopes to travel to meet them some day and to host them here in the states as well. Queen Megan attends Western Oregon University studying business management and dance. 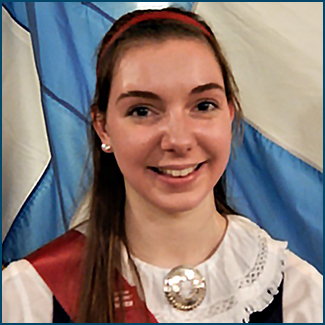 In her own words: “Throughout my wonderful experience as Miss Norway and as a representative for both my lodge, Sons of Norway #16, and the Festival, I learned to truly value the importance of my lodge and family that have so much passion for their heritage and traditions. With spending so much more time with my family, I have learned a ton about my heritage, especially the amazing journey my great- great grandparents took when they traveled to Astoria .” Thank you, Megan, for your years of service to the festival! 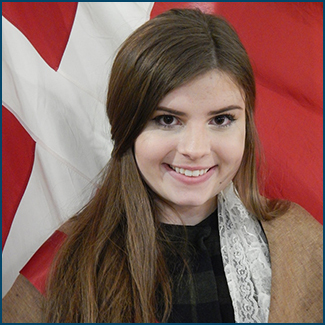 Sophie Hansen attends Knappa High School and is a member of the Lower Columbia Danish Society. She is both Danish and Norwegian from her mother’s side of the family and she visited Iceland in 2016. Sophie looks forward to joining in the festival, especially hearing stories from her elders and eluding the troll! Maya McGill is a sophomore at Seaside High School and a member of the Sons of Norway Nidaros #16 Lodge. Her grandmother on her father’s side arrived from Norway in the United States in 1957. 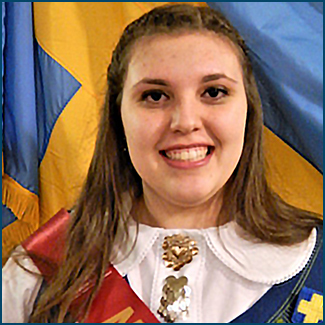 Maya is a former Junior Miss Norway and has attended many Sons of Norway lodge gatherings. She’s visited relatives in Norway five times. Her favorite festival activity is the hex burning at the bonfire after the Queen Coronation on Friday night. It’s a chance to rid oneself of all the bad luck for a year. 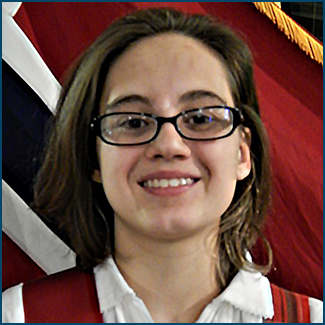 Kara Dowaliby is a junior at Warrenton High School and a fourth generation member of Vasa Astor Lodge #215. Her great-grandfather arrived from Sweden and her great great grandmother arrived from Finland in 1920. They met at a popular dance hall which today is Josephson’s Smokehouse. Kara has been involved in festival activities with her family all her life and her family has been involved in the festival for three generations. She has danced with the Nordic Viking Dancers for ten years. Kara loves the Queen’s Ball and dancing to Coreen Bergholm’s music. 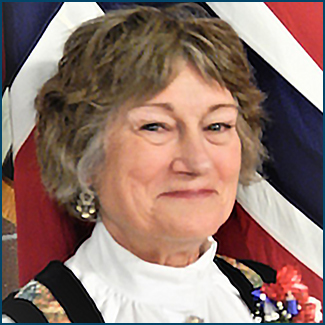 She likes eating Norwegian lefse and Swedish pea soup and is grateful that the the festival keeps alive our Scandinavian heritage and traditions. Michelle Devos lives in Warrenton where she’s employed by the Warrenton Hammond School District. She has family in Norway that has visited the area before and that will return next summer. Devos has good memories of the Op Tog (walking parade) when it was held in downtown Astoria and especially enjoyed the 2016 festival when her daughter Megan was crowned Miss Scandinavia. Like many festival volunteers, Senior Court Chaperone Sharon Hale is “Scandinavian by marriage.” Her husband’s grandparents immigrated from Norway and Sweden and married in the United States. Sharon spent many years working with the Nordic Viking moms’ group and has always supported the Midsummer Festival and Lucia Festival by attending and eating lots. She wears a costume originally made for her daughter when she was Senior Miss Norway in 1998. Her husband Dennis played tuba in his aunt Coreen Bergholm’s group, The Local Yokals, at the festival for many years. Sharon thinks that the festival is important to pass on traditions and heritage to the next generation. Jenna is in the second grade at Long Beach Elementary School in Washington. Her great great grandmother immigrated from Iceland in 1905. Her mother was Junior Miss Iceland in 1987. Jenna likes attending the festival and eating lefse! 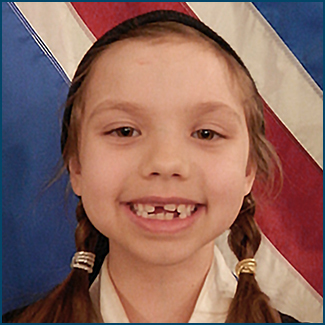 Junior Miss Sweden Maggie is in the first grade at Astor Elementary and a member of Astor VASA Lodge #215. Her great great grandfathers arrived in the U.S. from Sweden and Norway as teenagers. Her family volunteers at the festival to help decorate, dance, work in the Danish Lodge booth, and assist with the Troll Run and Friday night Olney Beef BBQ dinner. Maggie likes playing the games in the Barnefest area and eating floods like Danish aebleskiver, Swedish pancakes and Norwegian potato lefse. 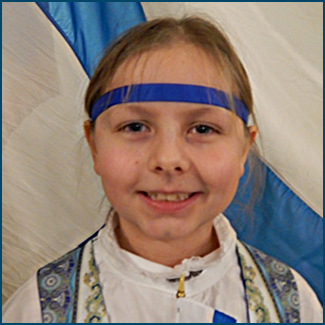 Junior Miss Finland Georgia is a second grader at Hilda Lahti Elementary in Knappa. Her Finnish relatives immigrated to North Dakota six generations ago. Junior Miss Denmark Norah is a second grader at Warrenton Grade School. 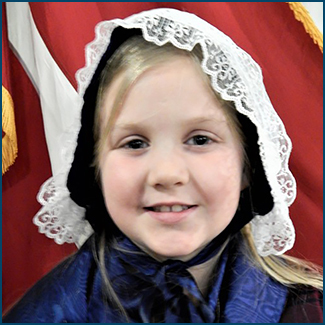 Her Danish relatives arrived in the U.S. four generations ago. Her mother was Junior Miss Denmark in 1987 and Senior Miss Denmark in 1997. Her sister was Junior Miss Denmark in 2015. Her family has been involved in festival activities since 1965. Norah likes trying all the different Scandinavian foods at the festival, especially the Danish aebleskiver and Norwegian krumkake. Augusta Hayrynen is in the second grade at Astor Elementary. She has Finnish heritage, as well as Norwegian. Both come from her father's side of the family. Her family has been involved as volunteers for the festival for setup and teardown for many years. Augusta enjoys the dancing at the festival because it’s fun. Crown Bearer Wyatt is the only male on the 2017 Court. 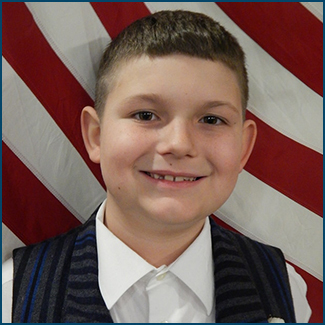 He’s a third grader at Warrenton Grade School and claims Finnish, Swedish, Norwegian and Danish ancestry. His sister was Miss Denmark 2013. He’s attended every festival since birth and has danced with the Nordic Viking Dancers for two years. Wyatt looks forward to riding the floats in the parades that the Court will attend. Junior Court Chaperone Emily Falleur was Junior Miss Denmark in 1983 and Senior Miss Denmark in 1992. 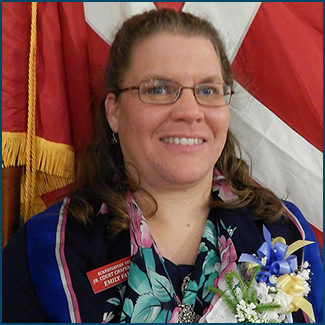 She’s a former member of the Viking Nordic Dancers and a current member of both the Lower Columbia Danish Society and Astor VASA Lodge #215. Her great grand parents immigrated from Sweden, Denmark and Norway. Her mother and her aunt made her costume and Emily is wearing an apron made of cloth woven by her great grandmother. Emily loves the traditional food, crafts, and dancing that are part of the festival.